The mission of the Boy Scouts of America is to prepare young people to make ethical and moral choices over their lifetimes by instilling in them the values of the Scout Oath and Law. The children best accomplish this with the support of their friends and family. 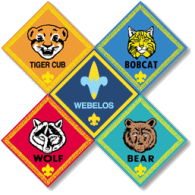 Pack 002 is a completely volunteer run organization. We depend on all families to help out to ensure the success of our events. Our volunteer opportunities include everything from being a den leader to helping sell concessions at our summer movie nights.